Godlan announced today that this year's annual SyteLine User Network conference in Las Vegas was a tremendous success boasting record attendance. Godlan sponsored a booth and featured InSync Anywhere, an Infor SyteLine ERP specific suite of products that enhances the SyteLine user experience, and provides user access to their SyteLine data anytime, anywhere. ...a tremendous success boasting record attendance. Godlan, a manufacturing ERP software specialist (SyteLine ERP), Asset Management specialist (EAM) and Infor Gold Channel Partner, announced today that SUN 2014 (this year's annual SyteLine User Network conference in Las Vegas) was a tremendous success boasting record attendance. Godlan sponsored a booth and featured InSync Anywhere, an Infor SyteLine ERP specific suite of products that enhances the SyteLine user experience, and provides user access to their SyteLine data anytime, anywhere. InSync Anywhere is not a bolt on solution or an afterthought for SyteLine ERP software - but from day one it was designed, written, and built for the SyteLine ERP environment by SyteLine experts. Specifically featured was InSync Barcode for SyteLine ERP. 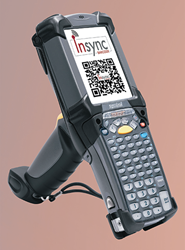 InSync Barcode provides barcode enabled advanced data collection anytime, anywhere. InSync Barcode is easy to deploy and manage - increasing inventory accuracy and employee productivity, while saving companies valuable time and resources. The annual SUN (SyteLine User Network) Conference is a collaboration, networking and educational event for SyteLine users from all over the world. Last year's event in Columbus, Ohio had solid attendance, while this year's event held in Las Vegas, Nevada broke the attendance record. InSync Barcode - Barcoding Made Easy For SyteLineWritten By SyteLine Experts Exclusively for SyteLine Customers Infor SyteLine ERP BrochureInfor SyteLine is a robust enterprise resource planning (ERP) solution specifically designed to help manufacturers improve productivity using manufacturing best practices and highly efficient process flows. Configurator provides a holistic approach to the design, sales, and production of customized products.Infor SyteLine Configurator ensures configured orders are feasible for the production department by providing clear visibility across inventory and schedules. Infor SyteLine Forecasting >Keep inventory levels and expenses low, without the risk of material shortages that can disrupt production, delay order fulfillment, and reduce customer satisfaction. Download the Infor 10x brochure >Infor 10x brochure download - Think flexible and collaborative. Think beautiful, scalable, integrated, and mobile.